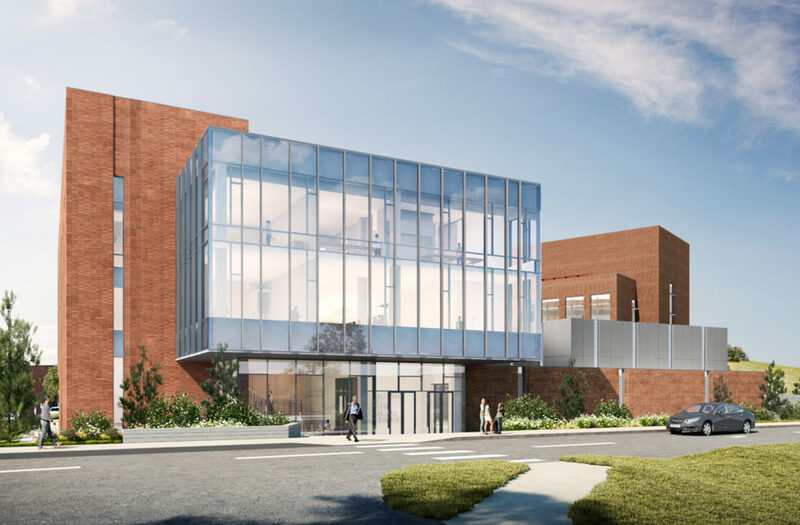 PULLMAN, Wash. — Washington State University’s College of Veterinary Medicine broke ground Saturday on a new facility for the Washington Animal Disease Diagnostic Laboratory (WADDL), creating a new wing of the Paul G. Allen Center for Global Animal Health. It marks a new era in diagnostic testing and disease surveillance, supporting public health and food security, animal health, and the success of thriving livestock industries. WADDL serves as a first alert system for both animal and human health. The new facility will allow WADDL to continue to serve as a critical resource for the state, region, and nation, ensuring that WSU remains an industry leader in disease surveillance, diagnostics, innovative research, and education on a global scale. When complete in 2021, the WADDL facility will provide the enhanced sample security and workflow, biosafety, and biosecurity required for increased testing capacity, discovery, and regulatory compliance. WADDL conducts more than 210,000 tests annually and that number is growing. Since 1974, WADDL’s testing demand has increased more than 250 percent with 2.5 million tests conducted in the last 10 years. WADDL is the only animal health diagnostic laboratory in Washington State officially sanctioned and funded to provide comprehensive animal, food, and environmental surveillance for diseases such as influenza, tuberculosis, West Nile encephalitis, Bovine spongiform encephalopathy (BSE), and foot-and-mouth disease. As such, WADDL is a critical resource for other state and federal agencies, including the Washington State departments of Agriculture and Health. WADDL serves as the first alert system by maintaining one of just 15 USDA National Animal Health Laboratory Network (NAHLN) Level 1 laboratories, the FDA Veterinary Laboratory Investigation and Response Network, and the CDC Laboratory Response Network for Bioterrorism. WADDL testing is vital for early disease detection, protecting public health and food security, and protecting Washington’s $1.5 billion animal agriculture industry. In 2014-15 WADDL detected the initial case of bird flu in the United States and helped prevent devastating economic losses to Washington’s poultry industry. The purpose for its disease detection and surveillance activities is to improve animal health, human health through detection of animal pathogens that can be transmitted to humans, food safety, and promote interstate commerce and global trade for animal agriculture. For example, WADDL has been on the forefront of testing for viruses, bacteria and parasites that infect fish and other aquatic animals for more than 20 years. For aquaculture producers within Washington State, this testing ensures that they can conduct uninterrupted intrastate, interstate, and international commerce with Washington grown products. It is crucial for their dominance in this arena. The new facility will optimize Paul G. Allen School for Global Animal Health research to develop 21st century animal and human diagnostics tests, implement innovative infection disease surveillance tools, and training the next generation of scientists and diagnosticians to advance global health security. The new facility project for WADDL received $23 million in the 2018 legislative session to begin construction of the building. An additional $36.4 million request will be made to the 2019 legislature to complete the building. WSU funded pre‑design and design of $1.9 million. The total cost for the new WADDL addition to the Allen Center is $61.9 million.